What To Knit When You're Expecting: Somebody's Buying My House! Hooray, hooray, we found a buyer! And thank heavens (as now is, for self-explanatory reasons, not the best time to be sitting around in a house you don't want to live in anymore). Closing is--eek--days before we fly to Hawaii for Christmas which is really not that many days from today. So our minds are aflurry with packing up books, arguing about whether it really truly is time to give away Dave's eternally unused exercise machine, figuring out the piano movers and their crane (?! ), packing boxes, lifting boxes, and buying newspapers. We are not simply packing our boxes and hauling them out into the street--we do have a place in mind, a place that I have been reluctant to talk about for fear of a) jinxing it, and b) not having any good photographs yet. Both of those fears are still alive and well, but...what the hell. 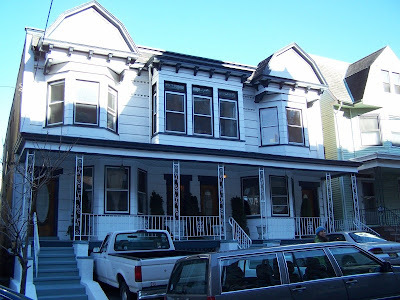 The house is an old Victorian, still in Jersey City, with all kinds of delightful quirks and a very specific personality. The current owners, friends of ours, have been obsessively restoring it, to the point of stripping all the paint off of the original wood detail, and redoing the floors and plasterwork wherever necessary. The house is, in essence, a pair of houses with connecting doors in between, and we're moving into the entire second floor level. It's huge. It has a grand paneled living room, two bay-windowed rooms, four bedrooms, two bathrooms, a library (snort. Yes, we're calling it the library. We are high-falutin'), and so very best of all, a sun room. A room with a whole wall of windows, with space for shelves of yarn and a project table and one day a spinning wheel--and mine. All mine. Seasonal Affective Disorder, be off with you! And if this jinxes anything, anything at all, I will.....start being a (more) superstitious person.